The Republican Party needs to regroup and regroup fast. While there has been an argument to make the party more centrists, I think this argument is lost both on value and sentiments. The Republican Party cannot win more votes if it disenfranchises its most active (in terms of word of mouth support as well as get out the vote effort) faction, the Christian conservatives. Every poll thus far have suggested that the Republican voters want to make the party more conservative, more right leaning rather center leaning. Those who can still remain Republican with this shift should do so, those who cannot should consider whether the Democrats or the Libertarians have what it takes to win their vote, or even whether they should sit out of the next election. Meanwhile the Republicans should proceed with preparations for the 2010 state elections because this election will have at least a decade long consequence. Why are the 2010 state elections so important? Because the next census will be conducted in 2010, and electoral changes will be reflected in the 2012 election. That means who ever is in charge of the states when the districts are redrawn will be doing so. Obviously more effort should be placed in states expected to gain, but even effort will be required in states expected to lose as their congressional district map will also be redrawn. Considerations regarding priority should also weigh which states will Republicans have the best chances. 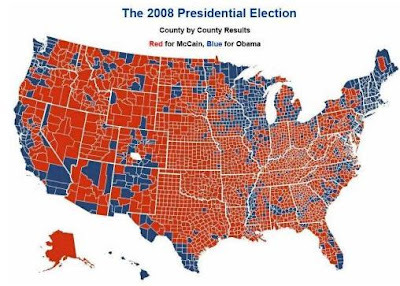 For this I referenced Jay Cost's recent post on 2008 polarization of the PotUS election. I recognize that many states may have voted for Obama that remain in Republican control but Jay's evaluation looks at how far the state population voted away from the national mean, thus providing a window at the trend for these states. From his analysis, I then categorized states as either red or blue, the remainder are listed as neutral leaners. I ranked neutral states gaining representations first because these states will also be in play for the Democrats, thus these states are where the Republicans must make the greatest efforts. Second is the state (Utah) where Republican will likely win if sufficient attention and effort is made. Third are neutral states where the Republicans cannot lose if they do not want to be redistricted out of representation. Fourth is the state (Louisiana) where Republicans will likely maintain representations as long as they can maintain control. Note that no solid Blue states are expected to gain or lose representation. For Democrats, they too will focus on the neutral states expected to gain or lose. But because none of the Blue states are expected to gain or lose, they will be able to place resources to win in Red states changing. Neutral states that leaned red expecting to gain representations are Texas (4), Arizona (2), Georgia (1), South Carolina (1), and Utah (1) for a total of 9. Neutral states that leaned blue expecting to gain representation are Florida (2), Nevada (1), North Carolina (1), and Oregon (1) for a total of 5. For the moment if we assume that the new district goes along with the color of the states, this would mean a net gain of 4 for Republicans. Neutral states that leaned red expecting to lose representations are Louisiana (1), and Missouri (1) for a total 2. Neutral states that leaned blue expecting to lose representations are New York (2), Ohio (2), California (1), Illinois (1), Massachusetts (1), Michigan (1), Minnesota (1), New Jersey (1), and Pennsylvania (1) for a total of 11. Assuming that the party in power based on the state leaning redraws the map to exclude their political opponent, this means a potential net loss of up to 9 congressional seats for the Republicans. If the Republicans cannot control the redrawing of the congressional district, they could lose an upward of 5 seats before 2012 election season even roll around.